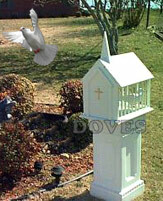 In addition to our release services, we also offer decorative White Dove Displays. "Oh That I had the wings of a dove. 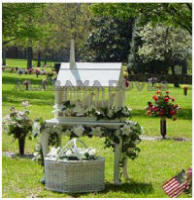 For then I would fly away and be at rest." 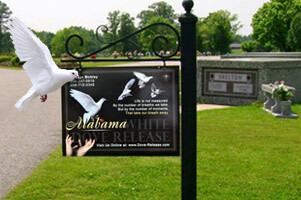 A ceremonial white dove release creates a beautiful symbolic moment of silence at any funeral or memorial. 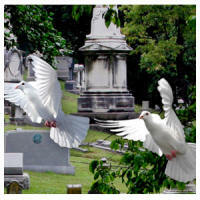 All one can hear is the gentle sounds of wings against the air as a flock of white doves are released. As the doves circle above like Angels taking formation, a lone white dove is released by a family member and ascends to join the flock, as if the Angels were escorting it home. This makes a heartfelt and symbolic conclusion to your loved one's memorial or funeral ceremony and can be a thoughtful and unique gift alternative to flowers. 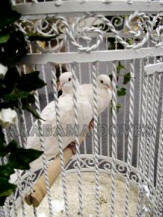 The Trinity: Three pure white dove are released representing the Father, Son and Holy Spirit. As they circle above, they await their loved one to join them. 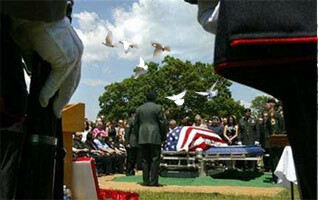 A lone dove is released by a family member, symbolic of the departed spirit making his/her final journey home. 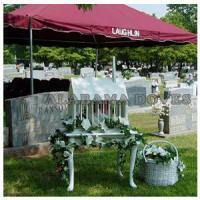 The Shepherd Release: A flock of pure white doves are released representing Angels, as they circle above, they await their loved one to join them. A lone white dove is released by a family member, it wings after the flock symbolic of the departed spirit making his//her final journey home.